If you’re looking to decorate an Asian-inspired home, it’s important to remember that the Asian style draws from many regions, including China, Japan, and Thailand to name a few. 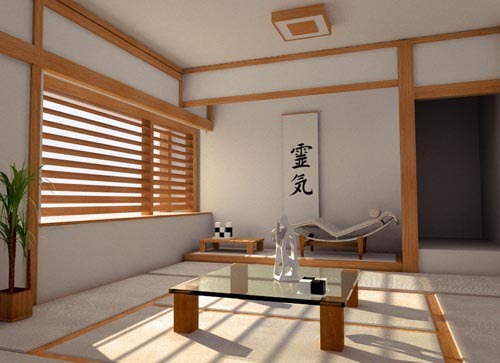 For interior design purposes, Asian style usually refers to either Japanese or Chinese influences, as they are very different. 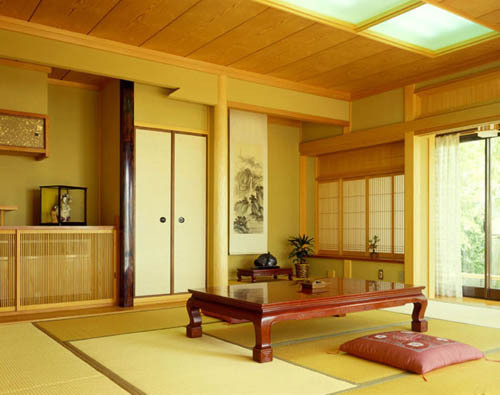 Japanese style is more calming and minimal in terms of furniture and decorative elements, while the Chinese uses bright colors and more detailed, dramatic decor. Streamlined, functional furniture fits the Japanese design style. The pieces are minimal both in terms of number as well as appearance. 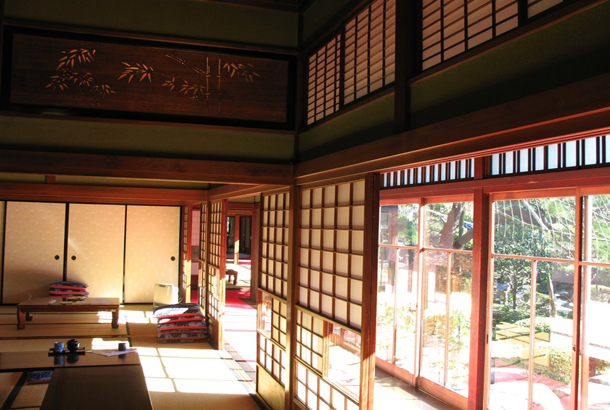 Designing a Japanese-inspired home involves adopting a mind-set of Zen principles, which strive for a calm, clear and open state of mind. How does that translate into interior design? Take away the clutter in a room, reduce the color palette (think water and earth tones) and clear the walls and floor areas (no brightly colored area rugs or paintings). 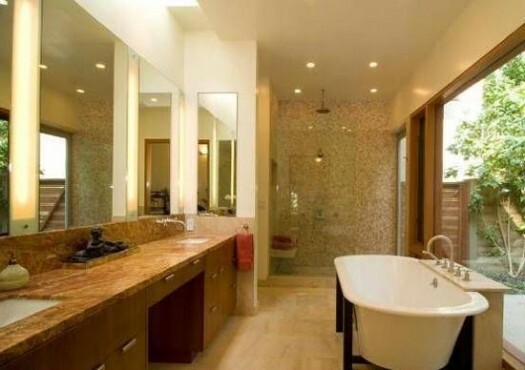 Walls can be a rich color, such as a chocolate brown or natural green, as long as they maintain the room’s earthy feel. 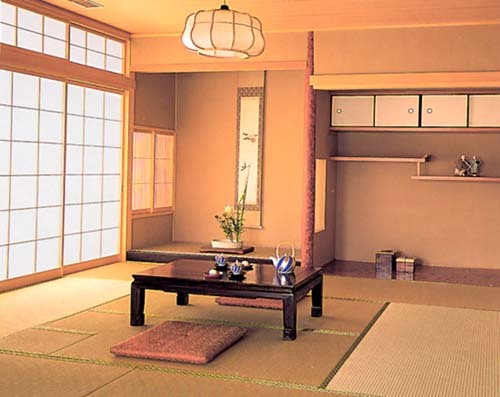 Hardwood floors and Tatami mats (made of rice and covering large areas), serve as traditional Japanese flooring. Furniture and accessories that sit lower to the floor help maintain a spaciousness, as opposed to large, imposing tables and sofas. Pillows can even be used for seating. 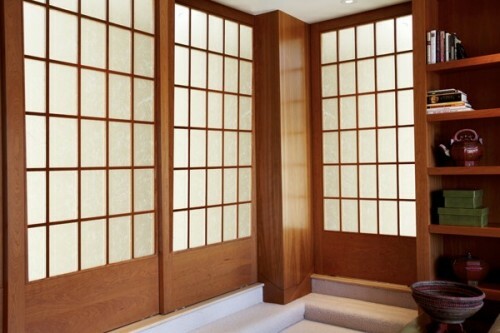 Any space should feel as open as possible, so translucent partitions called Shoji screens are a popular way to divide a room or provide privacy. 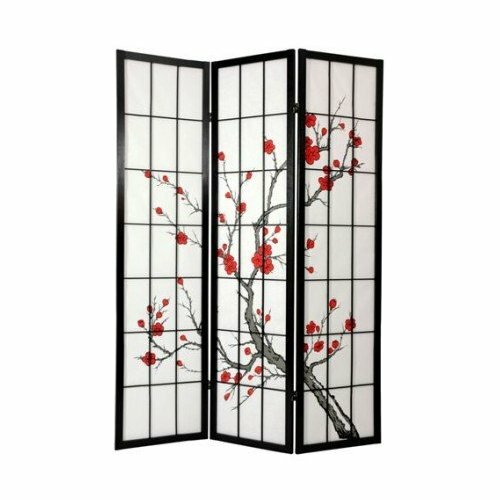 Sunlight easily diffuses through a Shoji screen, and they work well in covering unsightly window views without dampening any natural lighting. Furniture with flexibility keeps the flow relaxed; futons change from sofa to bed, Shoji screens can be moved depending on their immediate use, and pillows rearrange easily for comfortable seating. 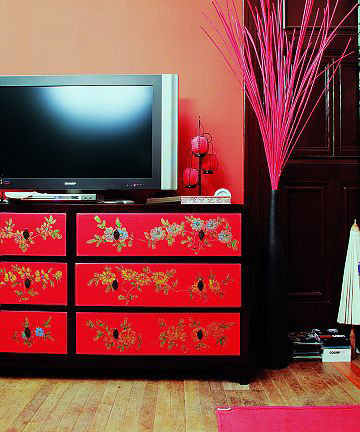 Chinese design is bold and dramatic, ideal for those who want vibrancy in their home. 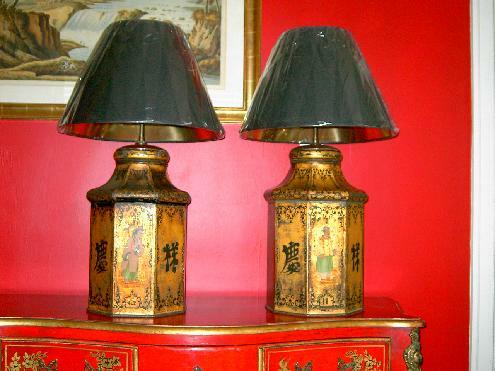 Several ornate pieces of carved furniture coated in a glossy black or red lacquer make the statement, often with some gold decoration and hand-painted oriental designs. Filling a room with too many stylized, striking pieces can be overwhelming and uninviting (as with the below photo), so choose one or two, and then use plain, dark wood furniture as a complement. 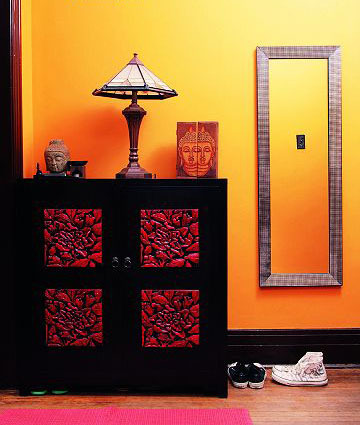 Walls can be painted in rich colors as well as patterned with oriental-inspired wallpaper of Chinese lettering, or exotic flowers, fish and birds. 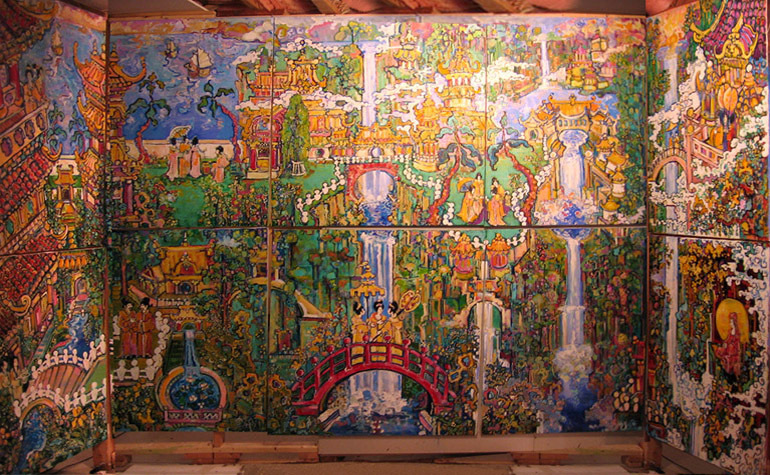 In more traditional Chinese wall decor, entire murals celebrate a dynamic culture by depicting historical scenes and legendary mythological figures. 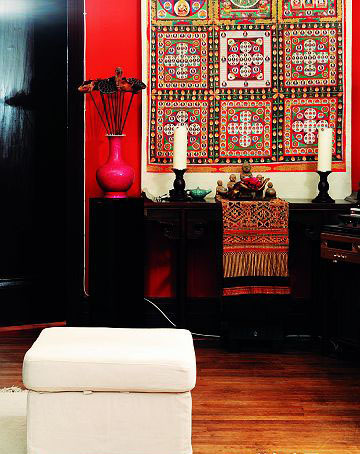 Although boldly colored and ornate, the Chinese design-inspired home is still comfortable and easy to live in. 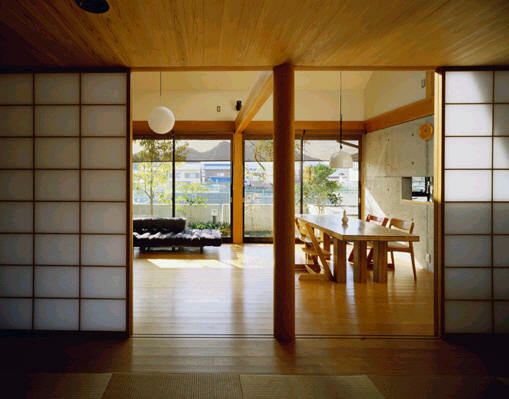 Natural lighting is key in Japanese design, so this style would be great for a room that already gets a lot of sunlight. Windows can be curtained with sheer fabrics or earth-toned fiber window shades, or even left uncovered. Low wattage interior lighting maintains the soothing effect into the evening. 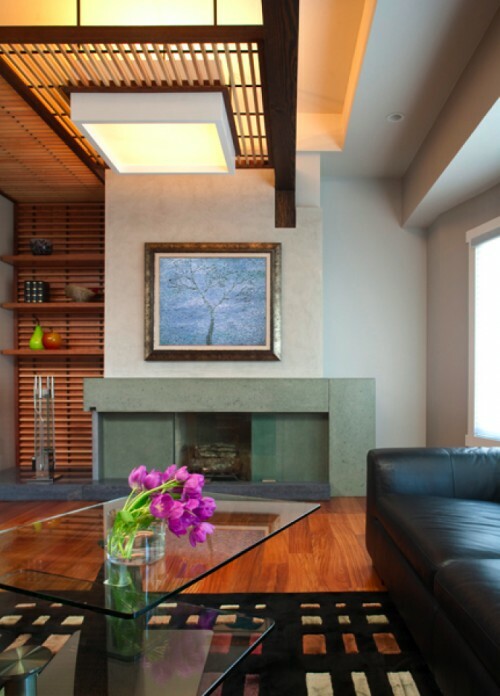 Try a rice paper lamp shade or something similar with mild colors. 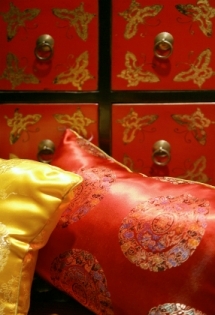 Chinese decor tends to be bolder and more colorful, specifically using bright reds (red is a color symbolic of good luck in China), blues and yellows. 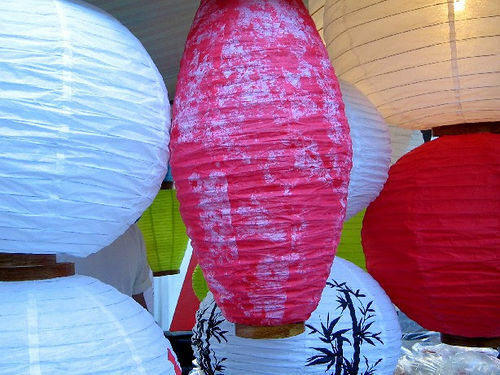 A lamp painted with mythical Chinese characters is a dramatic touch, or for a softer glow, hang Chinese paper lanterns. Overall, when you walk into a room that is a Japanese design-inspired, less is more and the effect should be a calming one. Neutral colors like the earth tones of gray, brown and green allow for visual flow without catching on a particular bright color. That doesn’t preclude the use of color, but keep it simple nonetheless. 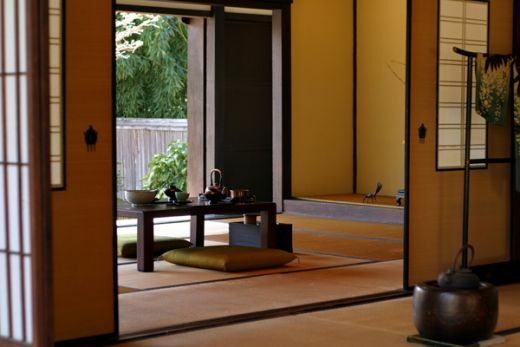 Frame an embroidered silk kimono of traditional Japanese design, or display a colorful porcelain tea set. 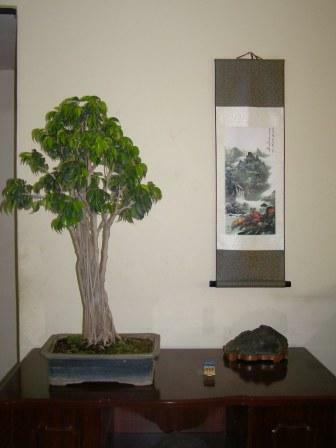 Otherwise, choose accessories that evoke nature; for example, use bamboo and stone materials, and decorate with bonsai plants and orchid flowers for more organic elements. 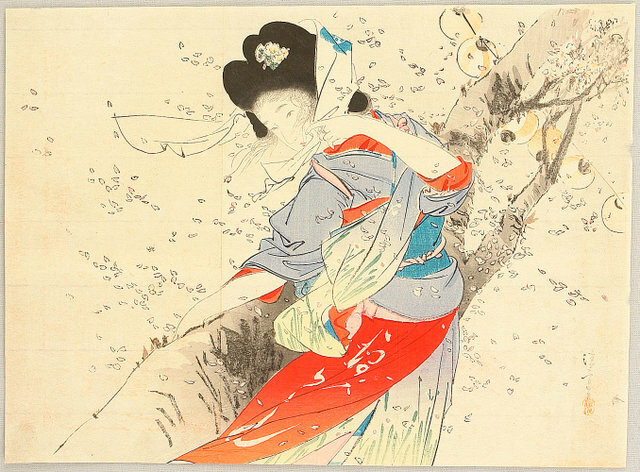 Chinese accents involve bright colors and rich, luxurious fabrics like silk embroidered in Chinese designs (often mystical beasts and animals like tigers, monkeys, dragons, as well as birds and flowers). 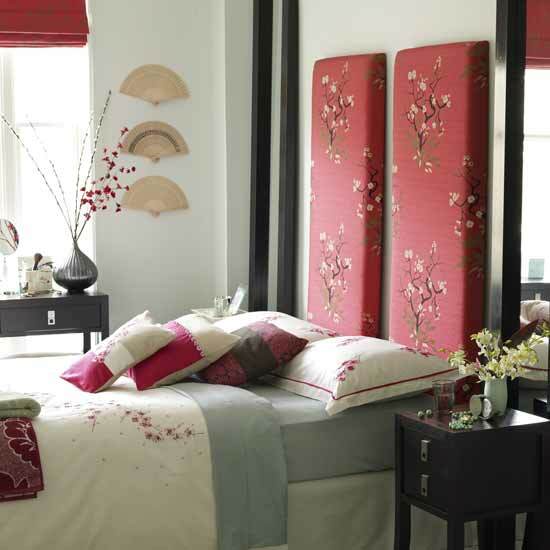 Pillows and curtains in these opulent fabrics imbue the room with a vitality particular to Chinese design. Ceramics and pottery with the same motifs are beautiful accessories atop tables and dark wooden chests. Unusual Chinese antiques can be found in street and flea markets, as well as on the Internet. 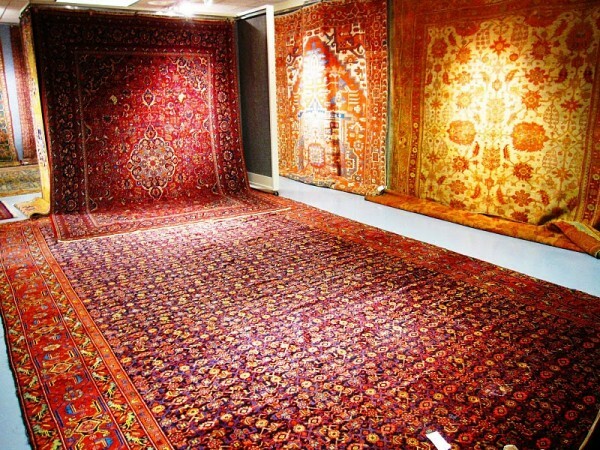 Chinese rugs are key for floor accents, and come in all sizes and prices. With such a wide range of accent pieces to choose from, it’s important to keep in mind that all it takes to create a Chinese design-inspired home is a striking piece of furnishing, a splash of color and a few choice accent pieces, from art to rugs to ceramic vases. Remember, designing your home means considering the rules and then breaking a few if you choose. 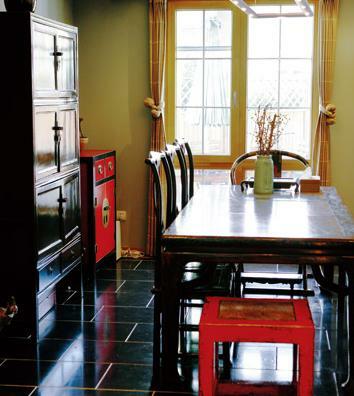 Modern Asian design is an example of how you can use traditional Japanese and Chinese styles and then infuse aspects of the two, or combine them with alternative design elements. 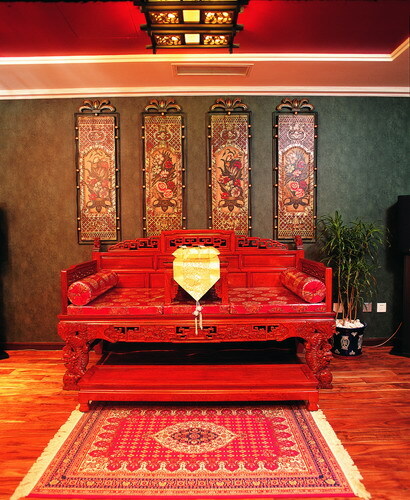 How about painted black bamboo bunk beds, white walls with a bonsai tree mural and a giant red area rug? The point is, create the space that feels home to you, and incorporate as many or all of the Asian-inspired design aspects as you see fit!